1.Preheat oven to 425°F. Line rimmed baking pan with parchment paper. 2.In large bowl, toss broccoli, mushrooms, carrots, onion, snap peas, oil, 1/2 teaspoon salt and 1/4 teaspoon pepper; spread in single layer on prepared pan. Roast vegetables 15 minutes. 3.In small bowl, stir garlic, hoisin, chili garlic sauce, and remaining 1/4 teaspoon salt and 1/4 teaspoon pepper. 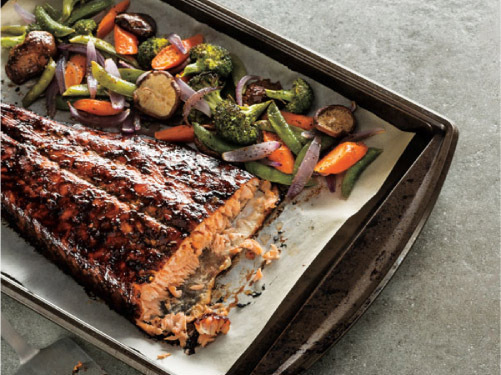 Move vegetables to 1 side of pan; place salmon, skin side down, on opposite side of pan. Evenly spread hoisin mixture over salmon. 4.Roast salmon and vegetables 10 minutes longer or until internal temperature of salmon reaches 145°F and vegetables are crisp-tender.